You know those Instagram feeds you come across that instantly make you feel good inside? And then you realize the person behind the feed makes you feel just as good? Cue Janna Maland and her positive perspective as a mama, blogger, attorney and travel enthusiast. 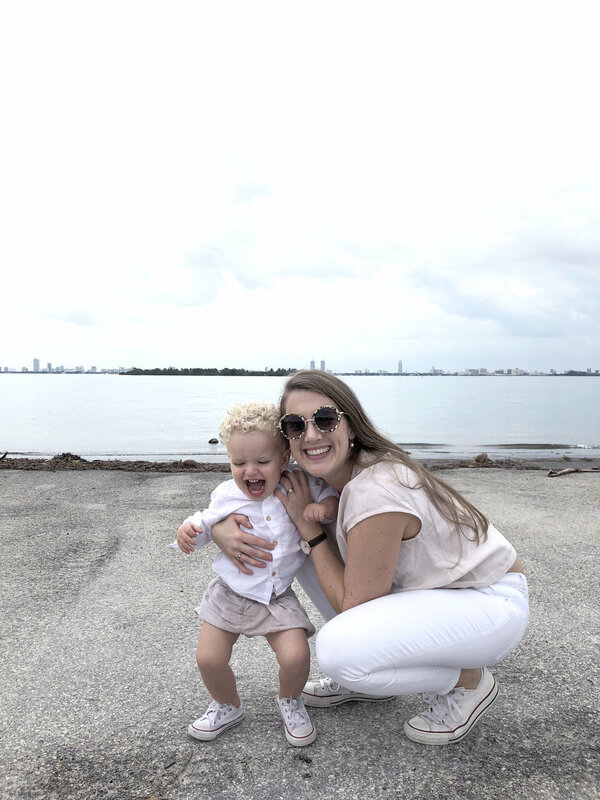 Janna was a long-time New Yorker before heading south to Miami with her husband and son in his second year of life. From retaking the bar exam in her new state, switching childcare setups 7 times in 6 months, and adjusting to a new city, Janna is incredibly relatable for anyone who has made a similar transition. Plus, we appreciate her authentic words about motherhood bringing her expected career trajectory off its tracks and onto one she wasn’t planning for. Oh, I’ve changed in so many ways. I love this question because I feel like I will have a different answer to it every day for the rest of my life. This is going to sound very meta, but the biggest change has been the uptick in constant change in my life since my son was born 2 years ago. Anything unexpected used to completely unravel me before motherhood. Since becoming a mom, unexpected has been my middle name. I’ve become much more comfortable with change that’s thrown at me from the outside (as opposed to well thought out and carefully planned by yours truly). That doesn’t mean I’ve given up on my control-loving type-A self. It just means I’ve developed my arsenal of coping mechanisms and game plans for when things hit the fan so that I have something familiar to fall back on in those situations. Simultaneously, I’ve also learned that it’s ok for me to change as a person. I don’t owe it to anyone to hold on to lifestyles, ideas, and people that no longer fit who I want to be. I used to think that meant that I had been wrong all along, but motherhood has really made me understand life as constantly evolving and requiring recalibration, so something or someone can be absolutely wonderful for a period of life and not really work very well for the next. I would love to be able to write about how my path to where I am now was this series of intentional and deliberate decisions, but honestly, life has made a lot of choices for me in the past 2 years. Then I had Magnus, and doesn’t that fit so nicely into my perfect linear story? I was going to be a working mom, I was going to show my child ambition, equality, and grit. I had to fight pretty hard against my husband’s family’s expectation that mothers stay at home with their children, so going back to work was a done deal. it was going to be exhausting but rewarding. Except that everything changed when my son was born. I was lucky enough to have a pretty long maternity leave (for American standards) and I had never felt happier or more myself in my life. I could have never imagined the sense of community I felt with other mamas and the spark of creativity that motherhood brought to my life and I wanted desperately to keep exploring this new side of me beyond my 5.5 months of leave. Unfortunately, we didn’t feel comfortable making that choice financially and I wasn’t ready for the uncertainty of not having a guaranteed job and income to come back to, so I went back to work accompanied by dread and tears and resentment. Not something I am incredibly proud of – and I might add that I was going back to working with a group of people whom I cherish and miss and who were incredibly supportive – but feelings are feelings. During my son’s second year of life, we moved cities (from NYC to Miami), then houses (from my in-laws into our own space). I started one job that immediately turned out not to work for me, took the Florida bar exam, went through some stress-related health issues and completed another job hunt. Oh, AND we changed our childcare setup no less than 7 times in 6 months. I would say I felt in control of my life for approximately 5 out of 365 days in 2018. I am happy to report that I have now found my groove. During that second job hunt I found gold in the form of my current gig with an amazing team (all but one of us have kids and the women outnumber the men 5 to 2), a boss who is a mother of 2 and just a really awesome manager, and predictable hours after which I can put my work phone away and focus on my family. While the grass is always greener where people seemingly have more time, more money or more help, I’m pretty happy with our balance. I have rediscovered that long lost spark of professional ambition that keeps me on my toes as a lawyer and as a mom. All of this is to say, if all of those major life changes had been by choice, yes, I would absolutely make the same choices again. (Possible caveat for moving cities because leaving New York is NEVER easy!). PS, my favorite part of the day is opening the door to our house and hearing my son yell “Mama!” from wherever he is and run excitedly into my arms. Let me preface this by saying that the following 3 words are all aspirational, be it more so or less so on any given day. Compassionate. I love the philosophy of positive parenting – even though after a full day of work it’s not always easy to be super empathetic. I want to be the kind of mother that my children can come to and share their stories and laughter and concerns with, so compassion – or empathy – is probably number one on my list. Patient. I am not a patient person. I am the kind of person who gets easily discouraged and has been known to resort to the well-known men’s tactic of claiming that I cannot do something in order for other people to do it for me. That is to say, ‘patient’ is the most aspirational word of the three. All that said, there is something about raising my son that has created space for more patience in me than I ever thought possible. Patience to let him feel all the feelings and patience to let him discover the world on his own terms, all while (patiently!) guiding him to be a good person. And lastly, patience with myself and my husband and everyone else in my life because figuring things out takes time and is messy. Intentional. In case you hadn’t noticed, I like thinking things through and planning things out. As a mom, I constantly try to visualize the kind of mother I aspire to be and then go step by step make that a reality. Some things are as easy and clear-cut as putting my phone away when I am playing with my son. Other things are a matter of on-the-spot fine tuning, like striving for the overall balance between being a lawyer, a mother, a wife, and a person. In order to be in the moment and focus on one thing at a time, I am a religious believer in family calendars, checklists and designated areas of responsibility. As I am sitting here writing this, I feel like I am taking care of myself! Writing is one of my guilty pleasures and something I hardly ever find time for, so thank you MU for giving me an assignment and a deadline! What I do (usually)is find time for is Saturday morning yoga in the park, two workouts a week with my husband and our personal trainer, podcasts or phone calls with friends during my commute and – one of my faves – breaking away at lunchtime to sit by Biscayne Bay in the sunshine and have a picnic with myself. My husband (da real MVP), my amazing au pair who goes above and beyond, my awesome colleagues who are also unapologetically moms, my son’s preschool teachers, our sweet housekeeper who actually has a degree in early childhood education and adores Magnus, and friends and family near and far who listen and help and support and love. Comparison is the thief of joy, they say. I’ve traditionally been quick to dismiss things I wasn’t instantly good at or remove myself from competitions if I wasn’t going to come out on top. Obviously you can’t just remove yourself from motherhood only because you saw someone else doing it all while sporting perfect hair and a fresh mani. So I’ve been working on focusing less on others and more on the things that bring me and my family joy, and celebrating incremental improvements instead of giving up because things aren’t perfect yet.